Freezer dinner rolls are easy to make and when you serve them steaming hot with butter melting into a golden pool…maybe a little wildflower honey… well dinner just got really special. Having brown and serve rolls all ready to go in the freezer is pretty handy — and it makes you look good, too. About ten minutes before dinner is going to be ready you just pop them in the oven to finish browning and to warm them up. You’ve already cooked them most of the way so you don’t have to thaw them or wait for them to rise. You can also freeze these unbaked, just take them out of the freezer about two hours before you want to serve them. I don’t know — I have this weird fantasy about being a 1950s kind of mom and serving hot, homemade rolls with the family dinner. Well, that doesn’t happen much around here but when I remember to make these homemade freezer dinner rolls it happens a lot more often. With my schedule and the kids’ schedule and my husband’s schedule dinner time can be crazy. This recipe makes soup or salad into a quick, filling meal. 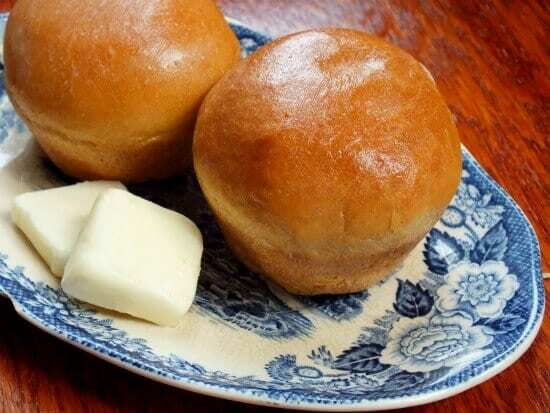 I also like to have these around so that when someone needs a meal or a blessing I can take over some hot rolls without it being totally stressful. You can double or triple the freezer dinner roll recipe pretty easily and you can adjust the size of the rolls to be exactly what you want. Big giant rolls for family dinners or smaller, dainty rolls for special occasions — it’s up to you. This recipe is going to make your life easier and your reputation as a cook a whole lot more impressive. Homemade brown and serve rolls, or frozen unbaked rolls, are handy to have in the freezer ready to be baked. They have that homemade flavor and will make any dinner special. Mix yeast and lukewarm water with about 2 tbs of the sugar. Let proof 10 minutes or until it gets frothy. Meanwhile, melt the butter and mix with the milk and eggs. Add the liquid ingredients, salt and sugar to the yeast. Add the flour until dough is formed. Knead for 10 minutes, adding flour as necessary to get a soft, elastic dough. Punch down, shape into 24 rolls and place on greased baking sheets. Freeze at this point, then bag in ziploc bags when frozen. May be frozen up to 4 weeks. When ready to use remove from freezer and place on greased baking sheet for 1 1/2 hours to thaw and rise. Bake at 350 until done but not browned about 8-10 minutes. When ready to serve, remove from freezer and bake until golden brown...about 10 minutes.